A large variety of size labels in different colors. Number Sizes (1,2,3,.., 30, 31, 33,…,54 ,56). If we don’t have the size or type you are looking for, let us know, and we will help you out. 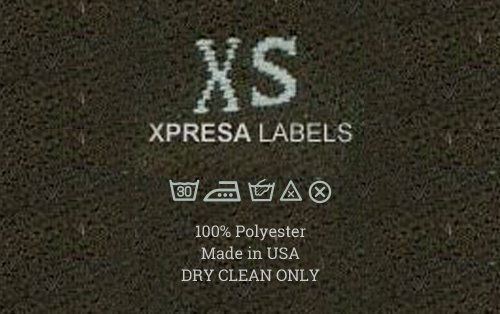 A selection of widely used labels, including “100% cotton”, “100% polyester”, “Made in America”, and many more. If we don’t have the type you are looking for, let us know, and we will help you out. Select care symbols to help your customers treat your products right. Maximum 5 symbols. Tell clients about your product, what materials did you use or the origin of your product.